Damn you, Windows Update. Or maybe Live Writer. Whichever of you decided not to save my half-written post the other day when the computer restarted, you’re on notice! That half-written post was pretty funny; it’s too bad that it was lost. C’est la vie; we shall move on. So where did I leave off… Oh yes, the Great Summer Yarn Search of 2010 (for a Cardigan that I’m Not Even Going to Make Because I Haven’t Finished Lowell’s Sweater and even if I Did I Wouldn’t Be Able to Finish It Before I Leave on the 18th of May Because of All the Other Things I Have to Do). I started this search by looking at the projects for the February Lady Sweater on Ravelry and seeing what yarn other people have used. This then led to checking out the yarn’s ratings on Ravelry and other projects made with this yarn. The problem was, most of the star ratings and comments didn’t say anything about how the yarn wears; they mostly mentioned how the yarn was to work with. And while that is very important (no one wants to work with a yarn that is so stiff that it hurts the hands), I really wanted to know if the finished object pilled or stretched or looked ratty after a while and how it feels to wear: heavy, warm, prone to snag? So I started searching the forums, then the web in general, for this info. After a while, I realized that I don’t have a lot of experience with plant fibers when not blended in small amounts with wool. This surprised me, because I have cotton and linen and acrylic yarns in my stash. Every year when the weather starts to get warm and sunny, I buy some plant fibers to “try them out” for summer knitting. But apparently I never made that final step to actually knitting them and seeing how they behave. 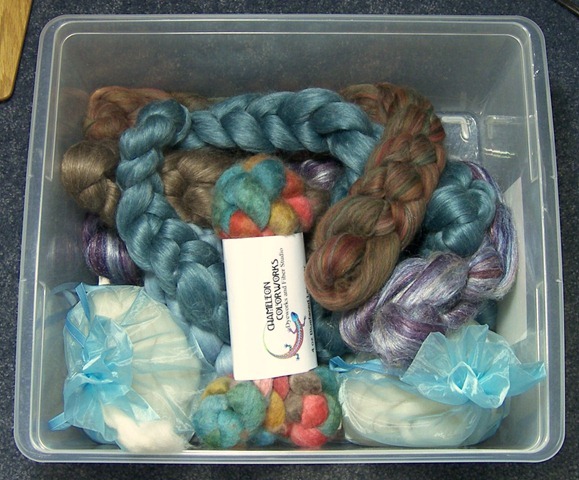 So, I have excavated my plant fibers from my stash and added a few popular yarns from the LYS. I will swatch them, wash them, hang them, and wash them again to stress test these yarns. Pilling will be exposed! Splitting will be revealed! Sag will be analyzed! And out of the goodness of my heart, I will write about these swatches for you to read! Everybody has that color (or combo of colors) that they just can’t seem to resist. For my mom, it’s a particular shade of teal or purple. Stephanie Pearl-McPhee loves oranges and Shannon Okey has trouble passing up greens. For me, it’s almost any shade of blue. (I can walk by electric blue with no problem. Also not that fond of navy.) For the last few years, it’s also been certain combinations of blue and brown. As you can see, blues definitely make up a good portion of the stash. But greens and purples aren’t far behind. I’ve got some nice browns and cream/whites/silvers. Yes, I’m low on reds and blacks, which I try to stay away from because they’re difficult to photograph well. And blacks just don’t show off the detailed stitches that I like. As for the orange-yellow section, what can I say. I like deep golds and burnt oranges but haven’t found many colorways using them that really speak to me. My pink section has been expanding lately- I’m not sure why, but I’ve been very attracted to certain pinks. So, looking at the above graph, you’d guess that there’s over 50% chance that a yarn pulled from my stash would be a “cool” color. There’s a good chance that yarn would be blue. But there are decent odds that it wouldn’t be, right? That it would be a purple or a green or even a brown? True, there is more blue than any other individual color, but added together the other colors outnumber the blues. 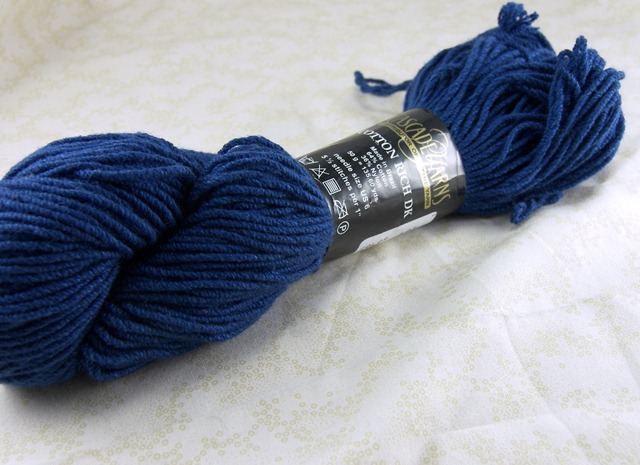 If you pulled a yarn from the stash, specifically looking for something not blue, you could find something, right? 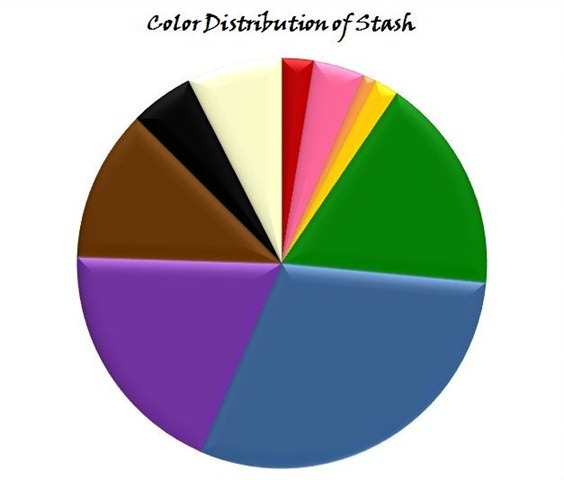 Then why is it, despite 70% of my stash being other colors, I always end up with a blue yarn when I go stash diving? I swatched many different yarns for this sock. Only two of them were blue. Guess which one ended up showing off the stitch pattern best? ShibuiKnits Sock (in Midnight I think). Step 1: Learn a new skill or craft. Knitting, spinning, crocheting, and home-roasting espresso all qualify. Optional: Tell everyone who will listen that you will not be getting a stash; promise to buy supplies as needed and only when the current project is completed. Step 2: Get just a bit of inexpensive supplies to practice new skill. Step 4: Get close to finishing first project and realize that you’re not ready for “the good stuff.” Buy some middle-level supplies. On second thought, this store is kind of out of the way, you’d better buy enough supplies for two projects so you don’t have to come back. Alternately, you need to buy enough supplies to justify the shipping costs. Step 5: You’re traveling. Pick up some local souvenir supplies. Step 6: You’re not ready for the “good stuff” yet and the souvenir supplies aren’t sparking the creative juices. Neither are the supplies from Step 4. Alternately, your tastes have evolved and using the supplies from Step 4 is like using sandpaper. Order some more “advanced” supplies because you won’t be able to get to the local store soon enough. Then find yourself near the local store; you really should buy some supplies while you’re there to support the local business. Step 7: Receive some supplies as gifts for birthday or holidays. It has begun. Start trying to find someplace to hide your now rapidly growing stash. 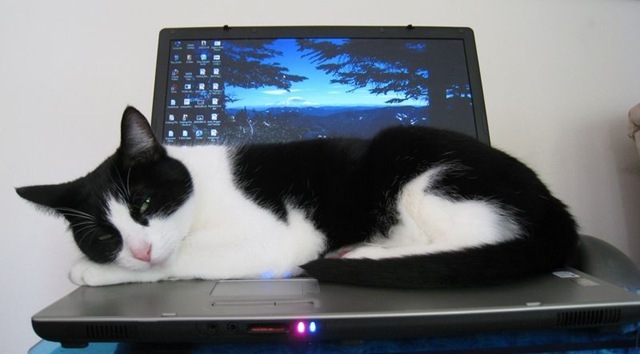 As much as I appreciate Kif’s guest post the other day while I was… indisposed, it was very hard wrestling the laptop back from him. That’s right, an entire completed Central Park Hoodie back! With short-row shoulder shaping, every cable turned the right way, the right size and everything. I win! 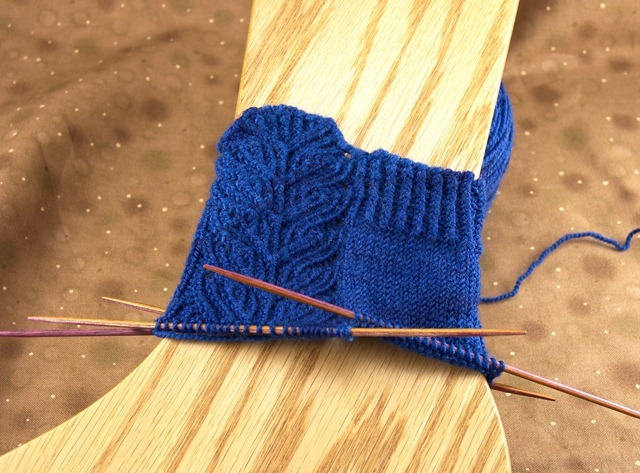 (…but I really shouldn’t say that in print until I’ve finished it, lest I anger the knitting gods again.) 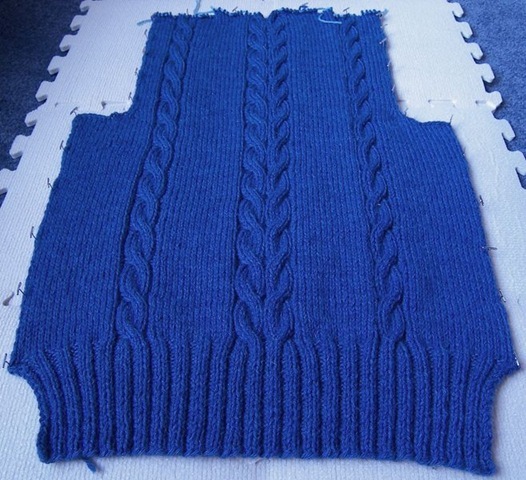 I’m on to the left front now, just finished the ribbing for it. In other news, I haven’t told you about my fun trip to Weaving Works. I went there with my mom while she was visiting. I hadn’t been there before, even though I’ve lived in the Seattle area for 6 years! I don’t have any pictures of the inside, sadly, but I can describe it for you! When you come inside, there’s a massive wall and shelves full of yarn like Noro, Lana Grossa, and Sirdar. There’s a great selection. And then there’s the back third of the store. Fiber and thread, in bulk. Undyed cotton, nylon, wool, bamboo, rayon and more in all different weights and then there’s the dyed selection of those threads! And the fiber! 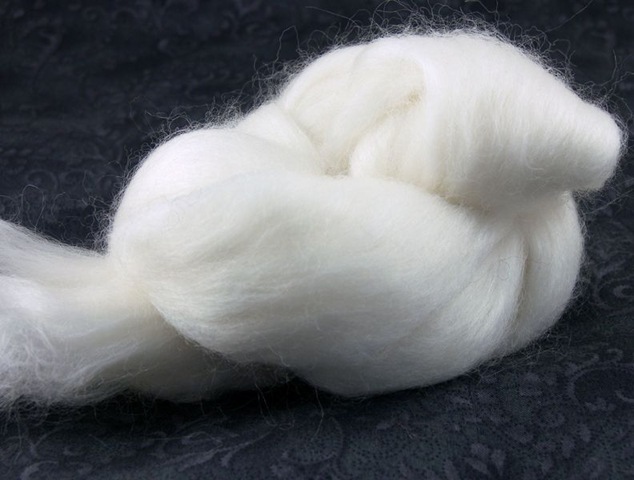 Silk, wool of different breeds, yak, mohair, hemp, even milk and Firestar; it’s enough to drive a spinner mad. 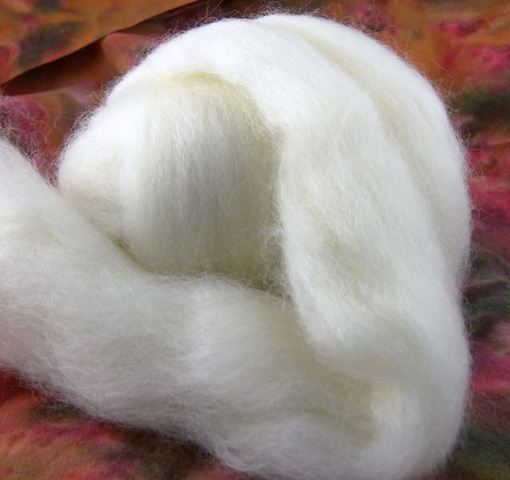 There’s pre-dyed wool for felting and spinning and tons of undyed/natural fiber for dying yourself. Silk in hankies and in cocoons if you want to do the reeling. 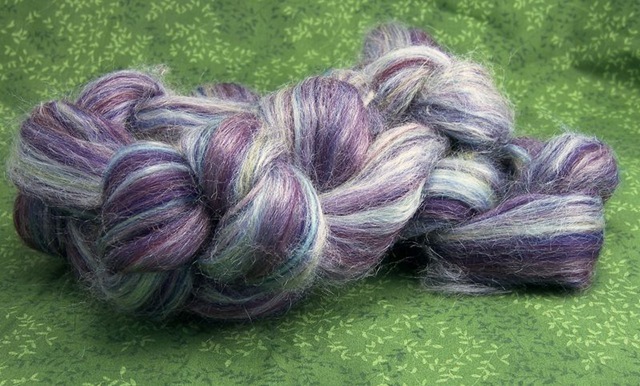 And some blends of fibers that are just great. 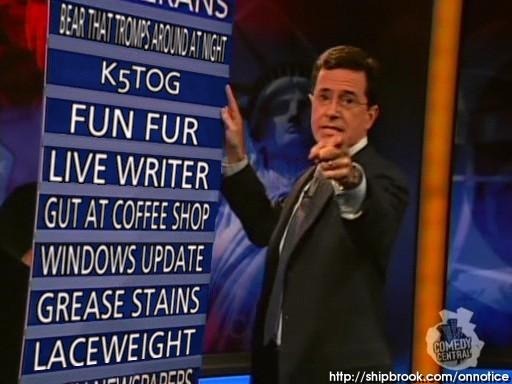 Sadly, not even the prices helped me decide- all the fiber is really well priced! After a lot of indecision and burying my hands in bins of fiber, I decided on a few things. About an ounce of 80% merino, 20% bamboo blend, undyed. This one’s just for experimenting. I love knitting with wool/bamboo blends so I’d like to see how it spins. 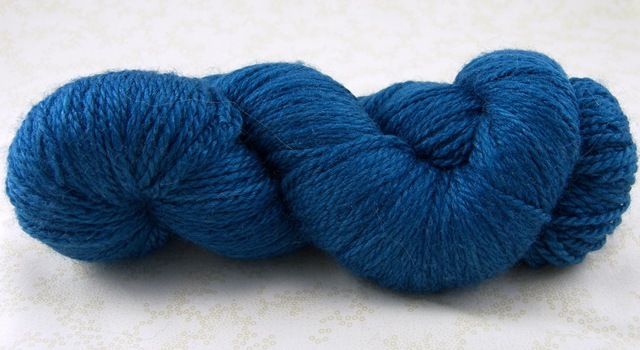 2.5 ounces of pure, undyed Blue-Faced Leicester top. It’s soooo soft. I thought I’d dye it myself, something fun. Of course now I can’t think of a good color combination; blue or purple or brown? 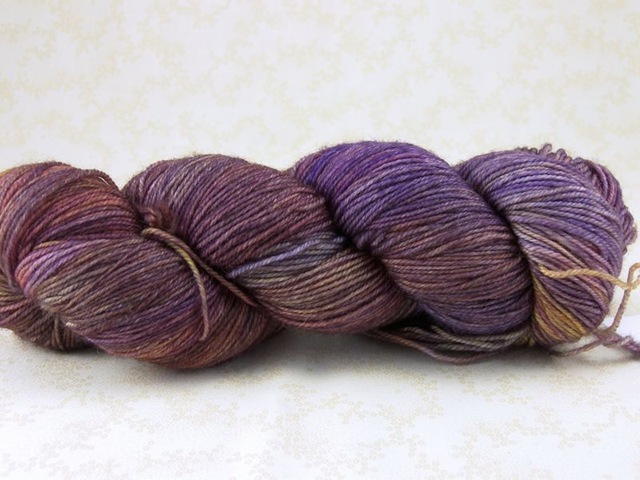 And I can’t decide if I want there to be subtle gradations, stripes, or just a gentle switching of shades as I spin. Any ideas? About 2 ounces of a pre-dyed 70% merino/30% silk blend. I can’t stop petting it, it’s so luscious! I even braided the hank so that it looks all pretty in the photo (notice I didn’t do that for the others!) They had a small sample spun up at the store and it was beautiful. This is what I’m going to spin as soon as I finish the CPH. And what am I going to spin it on, you ask? 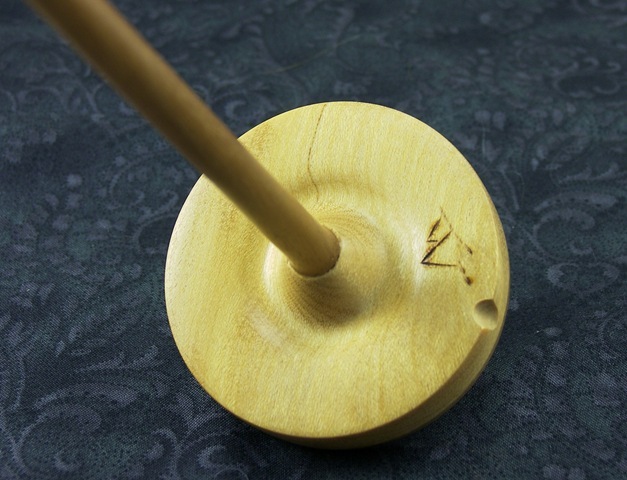 My brand new, top-whorl spindle from Cascade Spindle Co. I love their spindles and they’re all inspired by mountains in the Cascades! This one is Mt. Baker, which is north of me, and we went skiing there a few years back. The spindles are in the last part of the shop, with the spinning wheels, extra bobbins, niddy-noddys, and knitting needles. Oh, and the books!! So many shelves of books about anything to do with fiber. This is my new favorite store. It’s a good thing it’s not too close, otherwise I’d be overrun with fiber in no time! The gods are toying with me. I spent a goodly chunk of time churning out gauge swatches for my Central Park Hoodie. Four large swatches later and it looked like size 10 needles were the way to go. My yarn and needles came yesterday and in a strange fit of rationality, I decided to swatch again, just to be sure. I even washed and blocked the swatch. Guess what? 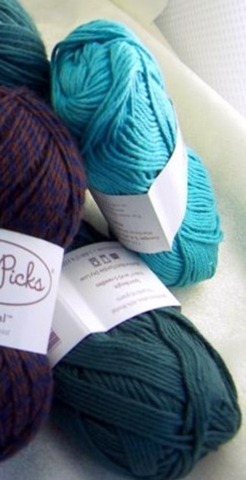 To take the bad taste of swatch out of my mouth, I’m going to show you the yarn that I got at Knit Purl last week. My mom came out and visited last week. 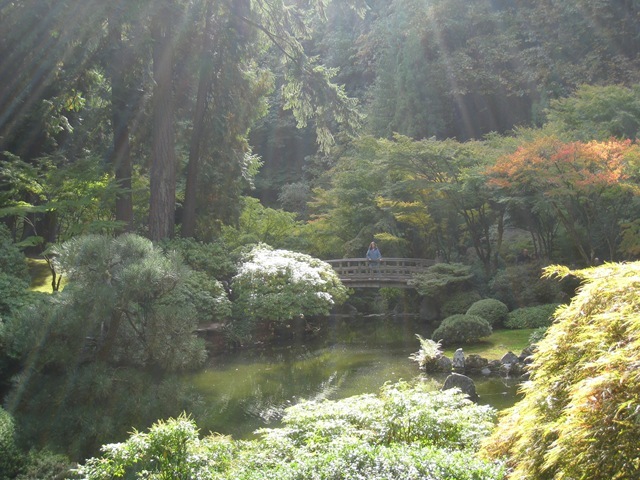 We drove down to Portland for a day and spent some time in the Japanese Garden, which was beautiful and very peaceful. That’s my mom on the bridge. Some sock yarn from Happiest Girl! Dyeworks, 75% superwash/25% nylon. The yarn isn’t very soft (washing will probably take care of that), but I am completely in love with the saturated teal next to the deep black. It looks fabulous in natural lighting. 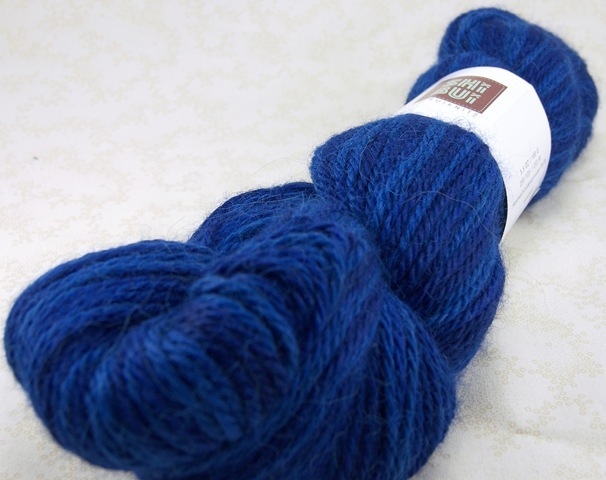 Sheep Shop Yarn (Sheep #3), a sport-weighty merino/silk blend. Deliciously soft and it has that dangerous sparkle to it that makes it hard to put down. 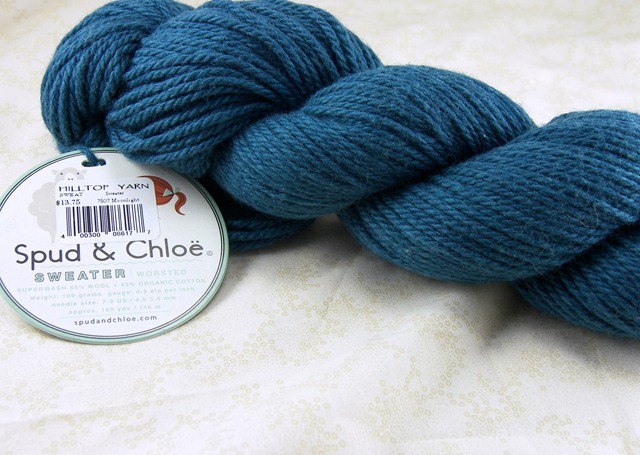 Last but not least, a yarn that my mom picked out that is to die for. 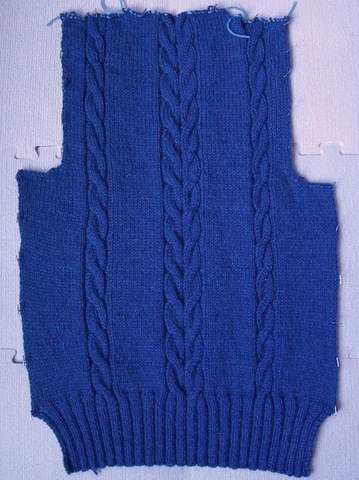 ShibuiKnits Baby Alpaca DK, in a very royal blue. So very, very soft! Favorite color? I don’t have a favorite color. Clearly I love all colors equally and nothing you can say will convince me that I love blue more than yellow. It’s obviously not true. Ever have one of those weeks that seemed to be very busy, but at the end of it you haven’t actually completed much? Yeah. I did get a few things done, including a project for Knotions that had been hanging over my head for a long time. And I ordered my Sock Summit souvenirs, which was fun. But I didn’t write any of the blog posts or take pictures for a tutorial I’ve had planned for a while… Where did the time go? It was also my birthday last week. 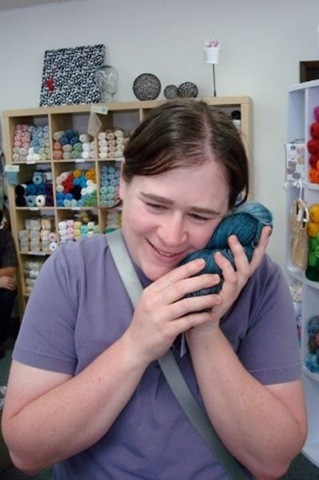 My in-laws have started a great tradition where they take me to a yarn store. Need more be said? It’s probably my favorite part of my birthday! 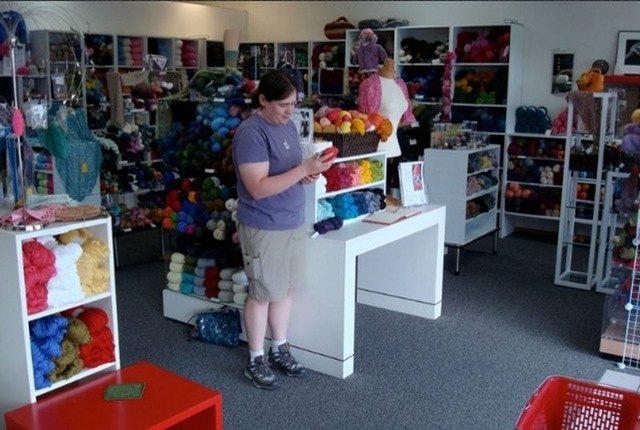 This year we visited CDA Yarn and Fiber while we were in Coeur d’Alene. 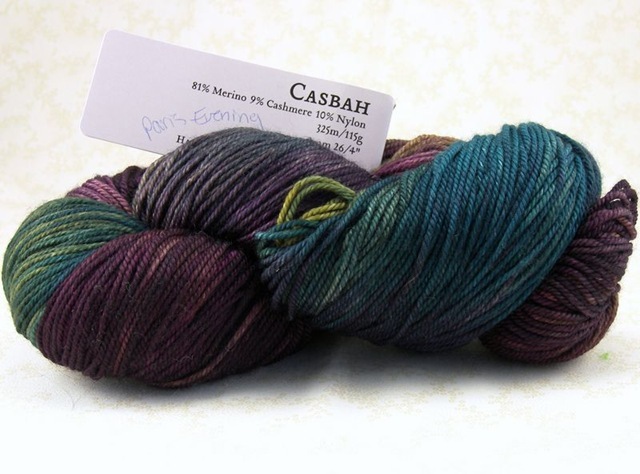 First up, Handmaiden Casbah. This yarn is so yummy. I was first drawn to the deep saturated colors, but the fiber content really sealed the deal. Merino, cashmere, nylon. This is a sock yarn, but I’m pretty sure it’s not destined to be a pair of socks. It’s too pretty to be covered by shoes. I have no idea what it’ll be instead though. Malabrigo! I’d actually never run across Malabrigo sock at a yarn store before and it was love at first sight. Like the Casbah, the color was the first thing that caught my eye. 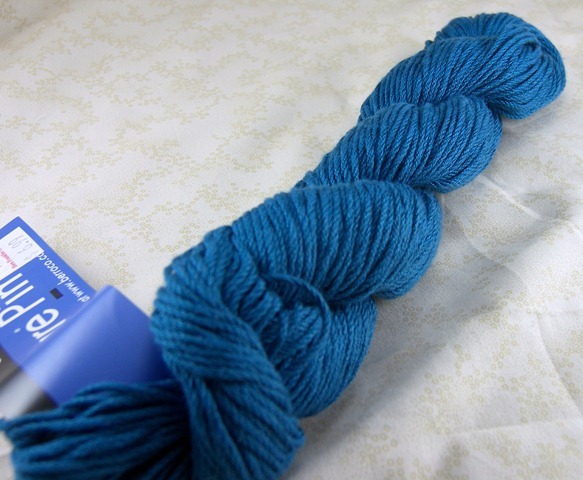 This skein is a gorgeous blue with that classic wool shimmer. It’s got subtle color changes from dark blue to very light. I love it. It’s so soft. I got two skeins, one in Persia and one in Archangel, which is a strangely fascinating colorway. It’s hard to describe and I don’t think the picture really captures it. It’s lilac and pink but not pink and gold/green… Crazy. I can’t wait to see how it knits up. 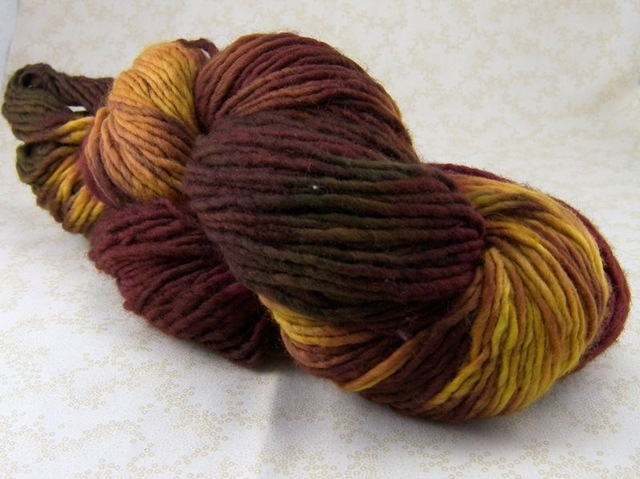 Speaking of Malabrigo, my brother-in-law bought me this squooshy skein of Malabrigo Chunky. He has pretty good taste in yarn for a non-fiber-addict. He got me some Misti Alpaca lace-weight last winter. He said that he looks for yarn that he would want to wear, something soft and cuddly. Can that criteria ever steer you wrong? After all, the number one cause of unexpected yarn purchases is the inability to put a skein down after picking it up “just to feel.” He chooses colors that he likes which rounds out my stash nicely. This isn’t a colorway that I would have picked for myself even though I really like the colors. But my stash has a distinct lack of red and gold no longer! I got one other thing from this shopping spree which is really neat, but I’m not going to post it yet. I have my reasons, don’t think I don’t! Stop judging me! I’ve decided that cleaning and knitting make a very dangerous combination. In between scrubbing, vacuuming, and laundry, I worked on the scarf. I sat on the guest bed while I knit, since that’s really the only place to sit that’s not the folding chair for the sewing machine and I left the scarf on the bed when I wasn’t working on it. I had about a foot left to knit and then the finishing. I figured it wouldn’t take very long, since the scarf is pretty simple. I didn’t really factor in the enormous task of weaving in all the ends. It took me almost an hour! Oy. But I finished it! After I finished the scarf, I stripped the bed to wash the sheets. Then I went downstairs for dinner. After dinner, I went back upstairs to block the scarf. I looked at the bed. There was no scarf, because I had thrown the sheets in the washer. I panicked. I said a very bad word, picturing all that work being felted in the washer as I stood there. I swear my heart stopped… then started up again going very fast. I went to go sit down, since my legs were a bit shaky. Then I saw the scarf, safe and sound, where I had put it on the table next to the blocking supplies. Apparently I’m smarter than I thought. But that was too close. I think I lost four years off my life. Nice, right? Mirasol Sulka in Snow White, Juniper, and Paprika. It’s about four feet long, since my father-in-law wanted a short scarf (which meant two feet that I didn’t have to knit!). Two skeins of White and Juniper, one of Paprika. It’s super squooshy and, like I said before, possessed of a nice halo. 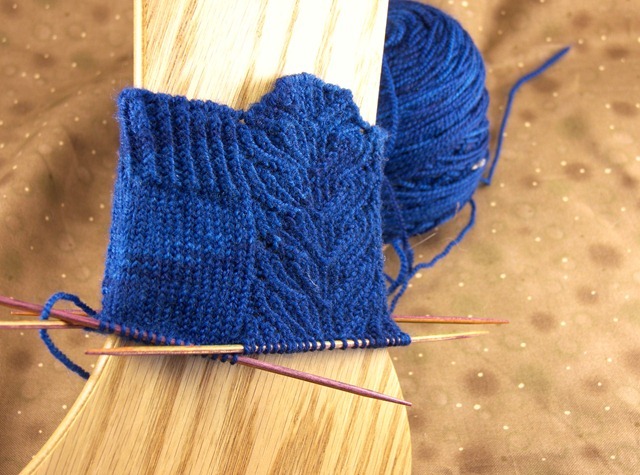 The pattern is the Multidirectional Scarf using intarsia instead of a variegated yarn for the color changes. 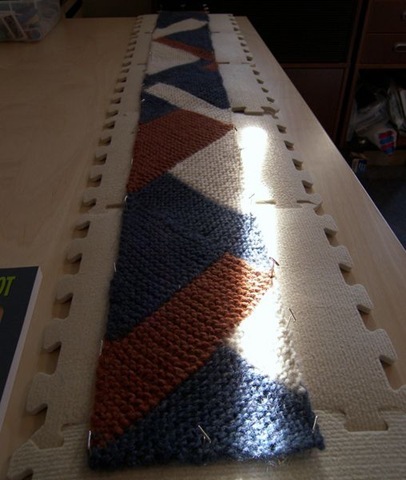 And each block of color meant two ends I had to weave in… Oh, that was a nightmare. But I really love this yarn. Next week, we’re all going to Coeur d’Alene for some outdoor activities. Biking, maybe some kayaking, etc. There’s two yarn stores I’ve already marked on the map! Hopefully I’ll have some time to post something while I’m there. Now that the scarf is finished, it’s time to go figure out what knitting I’m taking with me!